I came across a post about adding “ghosts” to images at Creepy Cupcakes, and it looked like such fun I decided to try it myself. 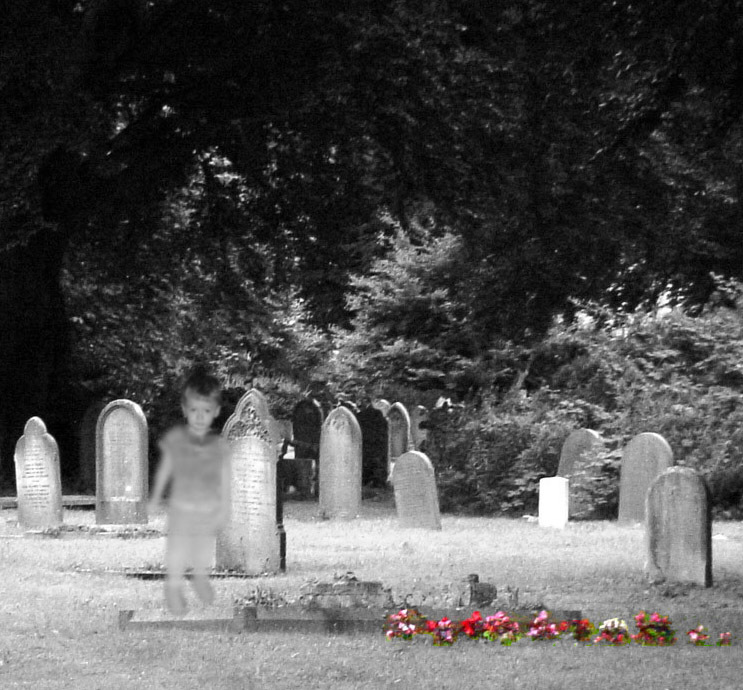 I threw this one together just as a test, using a photo of Shadowboy superimposed on a picture of a cemetery I took in England (click the photo for a larger version). I blurred his body more than his face–I think his solemn little eyes are creepy–and used an angled gradient to make parts of him less visible than others. Then the whole layer was made slightly transparent. The whole photo was converted to grayscale, then the flowers from the original color image were layered on top. This took me about 20 minutes of just fooling around. With a bit more time and effort you could create some really spooky, ethereal images. If you aren’t sure how to get started with Photoshop or a similar tool, let me point you to webdesign.org, which has tons of wonderful tutorials for doing all sorts of cool effects. It’s fun! Go turn something into a ghost today!